Like, not that he’s throwing his curveball with his changeup, at the same time, although that’d be a cool trick (and probably the toughest pitch to hit in baseball). Like, maybe Gio Gonzalez wants to throw his changeup more often, and that has thrown the Washington Nationals, his outcomes, and/or fantasy baseball players for a bit of a loop. Gonzalez’s overall numbers (a 3.57 ERA, 24.8 K%, 8.6 BB%, and 1.20 WHIP) weren’t too shabby. His ERA was notably worse than his FIP for the first time since 2009, though. You might even look at the career-worst BABIP against him in a season of at least 100 innings (.294) and LOB% (71.0) and say, Oh, that’s just a little bad luck, sign me up next time! That’ll probably work out, but I hope to find a little more of the why. I’ve started to wonder if Gonzalez didn’t also have a bit of a transition/growth period in 2014 as he began to prepare himself for his 30s. Maybe he’ll be better and a little more dependable. Gonzalez missed a handful of starts in 2014. That’s basically the reason he finished 56th in Zach Sanders’ end-of-season rankings and not closer to his preseason consensus of 16th. No disrespect to RotoGraphs’ Four Horsemen, but his problems with walks and tendency not to get deep into games were reasons I’d have hesitated to view him so favorably. He was more of a low-end No. 2 or high-end No. 3 fantasy starter in a 15-team mixed league, to me, someone likelier to finish closer to where he did in 2013 than a spot in the top 10. Gonzalez’s rates this past season kind of proved me wrong, I guess. A couple of rough outings and a trip to the disabled list are really all that ruined his May results. He also navigated a couple of other up-and-down months, true. I can’t help but wonder if his rates would even have been quite as good had he not gone through the tough periods, though. Like a veteran pitcher going through a lineup for the third time, I’ll work backwards. Gonzalez was on a roll in September. His manager and the writer of this piece noted the importance of curveball command to the left-hander’s then recent run. That’s likely true, in some way. The article suggests that increased arm strength since his trip to the disabled list was important. Such a development seems like it’d be beneficial for any of his offerings, but maybe it’s more important for the curveball, because of the snap, strain, however it works. Sometime in August, Gonzalez had regained his bearings, according to the observers, although some of the numbers (just not his ERA and win total, naturally) certainly suggest that he was working his way toward his stride in June and July, too. Anyway, in late August, there was more discussion of the importance of the curveball to the southpaw’s past and future success. That’s interesting in part because, in hindsight, he was awesome in September, yet he didn’t use the curveball any more often. The deuce has indeed been a key offering for Gonzalez. It’s been above-average for swinging strikes and well above-average for ground balls. It’s been and probably still is his best pitch. Just check out his lifetime outcomes on it. But, again, sort of, Gonzalez used it less frequently in the season’s final two months than he did in any prior. And he was pretty good to really good then. Maybe the Nats are correct and he needs to use Uncle Charlie more often in order to be dominant in the long term. Those last two months make up a small sample. But I’m curious as to why the club wasn’t more excited about his changeup. The team’s pitching coach, Steve McCatty, did acknowledge that Gonzalez’s changeup has improved. I wonder whether the club realizes by how much. Its whiff rate has risen crazily in the last half-decade. It certainly has to be most responsible for the rise in his overall swinging-strike percentage this year to a career-best 10.7%. It doesn’t hurt the pitch’s case that those rates increased even as Gonzalez deployed it more frequently in the last two years. He threw it about 20% of the time in the last four months of this past season and, for the first time in a full campaign, more frequently than his curveball. He also hit the strike zone with it at least 5% more often this season than in any of those past. His outcomes on the pitch (BAA, ISO) have improved noticeably in the last two years. Gonzalez’s changeup is also good for ground balls. Its rate on them declined this year – the Brooks numbers have it at just under 50%, while the PITCHf/x marks on FanGraphs have it just above 50% – but that still qualifies as good. Besides, with the surge in whiffs, who’s complaining? Now go back to May, when he went on the DL, because of shoulder inflammation, for the first time in his career. He missed about a month. He’d also been removed from a start in April with what his manager called tightness in the shoulder and later referred to it as normal soreness. It seems more like a precursor in hindsight, obviously. Maybe the DL stint affected Gonzalez. Maybe he noticed that his shoulder hurt a little more when he threw curves. Maybe he’d already been looking for an alternative. Maybe he’d seen his name in one of Jeff Zimmerman’s blogs and was already looking for a way to steer clear of it a little more regularly. Maybe his work on the changeup in spring training, which warranted a mention in March, wasn’t just for kicks. Maybe it was just an issue of arm strength, like the September WaPo article suggested, but there might be more to it. It might be worth noting possible tribulations of Gonzalez’s two-seamer, too. It’s been above-average, in terms of movement as well as ground-ball (basically) and swinging-strike benchmarks (definitely). Results against it have suffered in the past couple of years, though, as you can see from an earlier link. Perhaps that’s pure luck at work. I don’t notice any major differences in breaks or release points for the pitch. The worse outcomes may have something to do with his reduced usage of the pitch, however, as if he began to trust it less frequently. 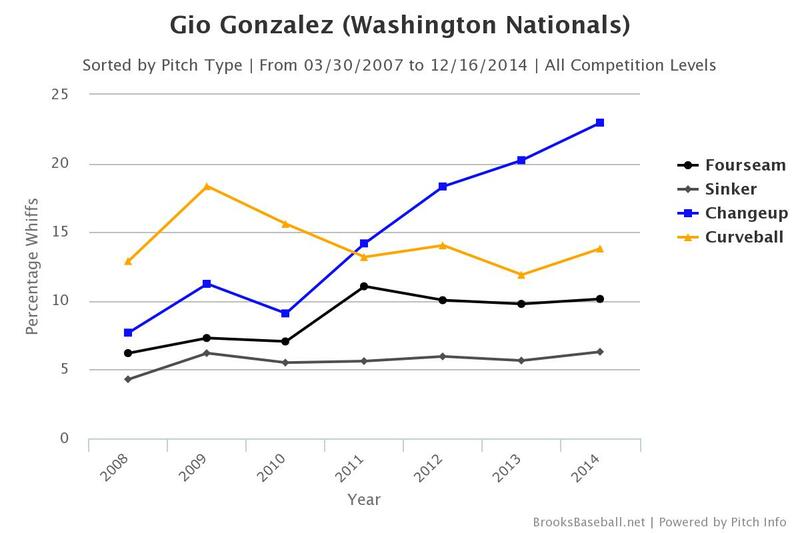 For whatever reasons, hitters began to have more success against Gonzalez’s sinker in the past couple of seasons. That was particularly true in the first couple of months of this past season. The offering’s results improved as the season wore on, however, and that basically coincided with increased changeup usage. What’s interesting is that he threw the two-seamer more often in September (his best month of the season) and in his playoff outing than he did in the three previous months and at about the same rate he did in the previous year. It’s possible that Gonzalez’s newfound belief in his changeup helped him to regain confidence in his sinker. Maybe he was in search of a pitch that would keep the opposition off his two-seamer in the first place. Maybe that’s why he tried to get more from his changeup this past winter and spring. Maybe the search is over. It’d be understandable if he and his catchers took some time to adjust to its increase in usage, though, especially because he’d also missed time. Gonzalez has steadily improved his walk rate, but at 9.3% in both 2012 and 2013, it still wasn’t great. Nonetheless, perhaps, with the way he pitched in April, he was on schedule to continue the trend. I have my doubts, though. His curveball has a lower zone rate, like his changeup, and he needs those pitches to move outside the strike zone to be effective. There aren’t any real signs that he’s changed in terms of his wildness. When Gonzalez uses each of his pitches may be changing, though. The curveball has been his weapon of choice when he’s ahead in the count, historically, to both left- and right-handed batters. Even this year, it was the top pick in those situations. And when he’s been behind – this becomes much more relevant against RHBs – he’s gone to fastballs (four- or two-seam). Either he’s had to go to something he can locate and/or command better, or he can’t fool batters with 3-1 curveballs, or both. He can’t really throw the curve when he’s behind. The changeup (2014) is a different story. He commands it better now, and it looks a lot like his sinker, a pitch he still used often when behind. It’s a way to salvage some outcomes he might not have otherwise. He could throw it in any count, really. Gonzalez’s curveball remains a great pitch. It does this. But the pitch category is associated with health issues much more so than the changeup. Plus, his changeup seems to have become another really good pitch. Curveballs, in general, have reverse platoon splits, but his has been really effective against both RHBs and LHBs. If his changeup gets great results against RHHs, in any count, why not use it more habitually and allow his curve to exist most often as a slider-like weapon against LHHs? The change might be worse for ground balls and hits but better for strikeouts and walks. Gonzalez could retain K’s more so as he ages, and the tradeoff is his need to depend on his infield defense a bit more often. Seems acceptable. The Nationals were focused on Gonzalez’s curveball this past season. Various D.C. voices wanted him to throw it more often. At some point, it seems, he made a conscious decision to throw more changeups, however. I’m speculating about the reasons. There are parts of this story I don’t have, I’m sure. There may be parts of it I have all wrong, too. I’m not entirely sure of what’s going on. But I like what I see, on his part anyway. At a minimum, he’s broadened his repertoire notably. We hoped you liked reading Gio Gonzalez Throws Curve with Change? by Nicholas Minnix!